The EC 5000 has 2 - 1.5 HP motors, 3 stage filtration with a 99.97% HEPA filter. 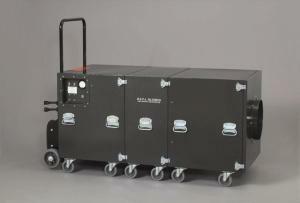 The unit comes in 3 sections, each with casters and carrying handles so it can be moved around easily. The motor section has a built in dolly and stair climbers for ease of handling. It comes with a 25 foot long 12" hose, 2 hose clamps and a duct mounting flange. 3 year manufacturers warranty.